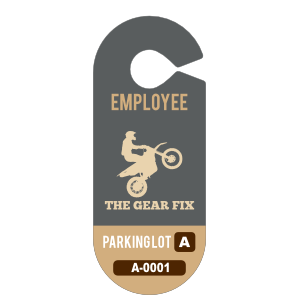 This employee parking permit hang tag has multiple color areas that can be customized to your match the color scheme of your business. You can also personalize the text, fonts, and clipart. You can even upload your logo or image! This design has room for your company branding, the timeframe the pass is valid for and the permit number. These high-quality parking permits hang from the rear view mirror for high visibility and are printed 20 mil polystyrene plastic that is flexible and durable, to make sure they last a long time.